The major holidays in the Christian faith center around the life and death of Jesus Christ, the son of God. Easter and Christmas are the biggest Christian celebrations. Whatever part of the world you may live and whatever experiences your soul seeks, may the love hidden deep inside your heart. 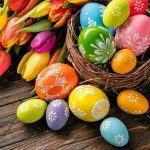 Spring, holidays, special days, event, celebration, decoration, Easter, eggs, bunny, basket, ribbon, grass, fresh, flowers, love, gift, present, arrangement, cross, still life, tulips, daffodils, hyacinths, snowdrops, freesias, Christmas tree, candle, globes, together, bright, garland, light, holy, winter, season.